An exhibition at the Bungil Gallery in Roma, Shoot Straight You Bastards, by artists who collectively call themselves, the 6 artists from out of nowhere, creates a powerful document about relationships to place which are, as Lippard demands, ‘provocative and critical enough to make people think.’ These artists are from the Bowen Basin area around Central Southern Queensland that is currently the centre of a mining boom driven by the world’s need for cheap energy. In the enthusiastic push for profits to bolster shareholder’s returns and to reduce budget deficits, both the mining industry and the government have grasped the opportunity. While it may seem perfectly logical to develop a resource and capitalise upon it, there are many who oppose it. The principle concerns shared by many of these local communities are the threats to the farming and grazing productivity of the land, and the potential risk for long term damage to the quality of underground water across the region where mining and gas extraction is undertaken. The transformative effect on the communities and the landscape should not be underestimated. Elizabeth Corfe’s life, has been shaped by a lifetime immersed in the highs and lows of making a living off the land. 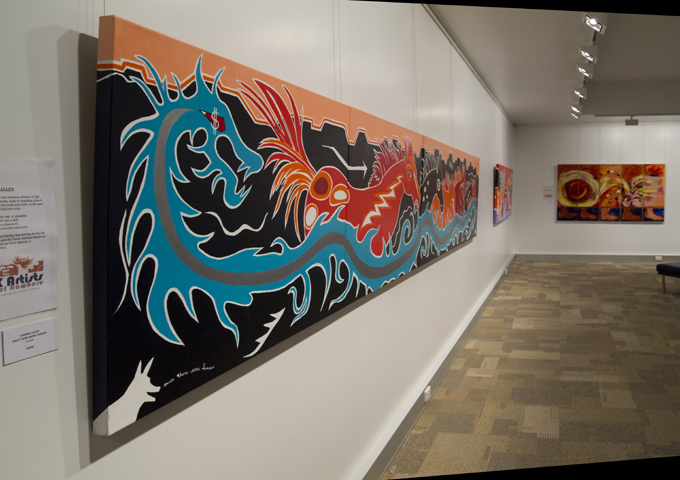 Even though there have been obstacles they remain dedicated to their art and when possible have engaged in art training through a range of opportunities including academic study, Flying Arts and the Roma Art Group. 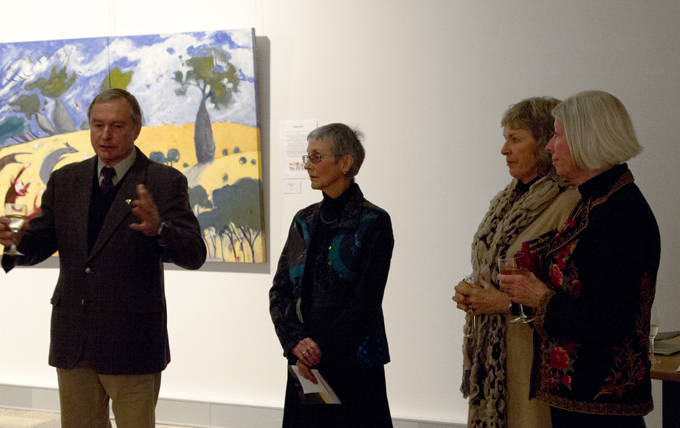 Their works are technically and conceptually strident—quite distinct from the stereotypic pastoral ‘windmill in the sunset’ and ‘gum tree lined billabong’ paintings that art aesthetes may consider regional artists make. In dry Australia, without artesian water we die. The work of these artists does bring us ‘back to earth’ in ‘real’ and ‘imaginary’ ways. 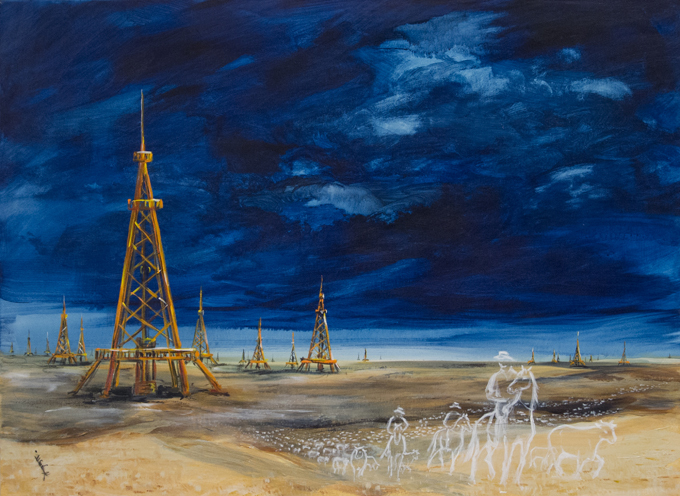 In the work Banished, Elizabeth Corfe presents a landscape of drilling rigs against blue sky and beige earth—ghostly forms of men on horseback tend phantom flocks and herds that may no longer exist. 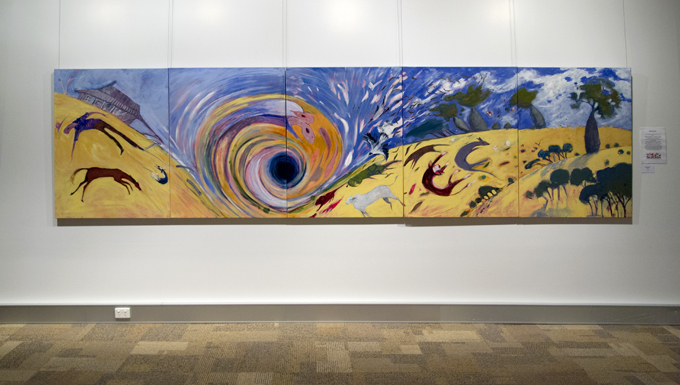 An expansive piece entitled Sucked in by Barbara Hancock depicts a vortex of change ‘sucking in’ the landscape and its inhabitants—several figures inside the central maelstrom mimic the expression of the subject in Edvard Munch’s The Scream. In Sandra Allen’s Once there were horses a snake-like chimerical (Chinese) dragon with $ signs for eyes scares horses to take flight. Refer to their website for more examples. The Shoot Straight You Bastards exhibition has already travelled to outback regions and is set to open in Wondoan in the next month, then on to Brisbane at the White Canvas Gallery in November. Artists do ‘teach us to see’ and it is commendable that these six artists work hard to engage their communities in issues that are important. Ultimately art is a considered and authentic vision of the world and ideas. 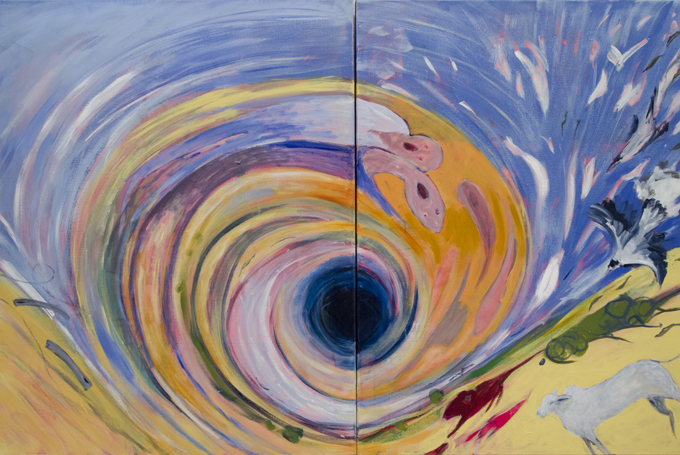 Perhaps through the dissemination and connection with others these artists’ vision may bridge a gap and change perceptions. The 6 artists from out of nowhere are certainly getting ‘into the fray’. Croggan, N 2010, ‘Bonita Ely’s art of ecology’, Art & Australia, vol. 48, no. 1, Spring 2010. Lippard, LR 2007, ‘Weather Report: Expecting the Unexpected’, in K Gerdes (ed. ), Weather Report: Art and Climate Change, Boulder Museum of Contemporary Art, Boulder, Colorado, USA. Lippard, LR 1997, The Lure of the Local: Sense of Place in a Multicentered Society, The New Press, New York. Smith, S 2007, ‘Weather Systems: Questions About Art and Climate Change’, in K Gerdes (ed. ), Weather Report: Art and Climate Change, Boulder Museum of Contemporary Art, Boulder, Colorado, USA.